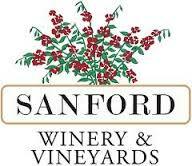 The Sanford Benedict Vineyard Pinot Noir is exclusively sourced from our historic estate vineyard in the esteemed Sta. Rita Hills AVA. Planted in 1971, this iconic vineyard consistently produces distinctively superb Pinot Noir. The vintage was as close to perfect as a winemaker can ask. A long season with ideal conditions in the summer and fall resulted in wines that while approachable upon release, will age well for years to come. This wine exudes earthy aromas of dried herbs, cherry and cranberry. In addition to the enticing fruit and earth, this lovely Pinot exhibits floral and spice aromas. The silky palate is framed nicely by balanced acidity and ripe tannins. Aged in French Oak barrels for 15 months where it gained concentration and complexity, this wine will improve in the bottle for 5 to 10 years with proper cellaring. The English word "wine" comes from the Proto-Germanic winam, an early borrowing from the Latin vinum, "wine" or "(grape) vine", itself derived from the Proto-Indo-European stem "wino".